If you backup your iPhone using iTunes, the backup file is stored on your PC or Mac... but where? Want to find your iTunes backup location, extract data from a backup, or restore your iPhone from a backup? You're in the right place. Your backups will now be listed for you as seen in the image below. Note that these files are not human-readable. If you need to view and access this data, skip to step 3. To access this location, click in the menu bar, then type the address above. In the menu bar, click iTunes -> Preferences. Control-click the backup that you want from the list. Note that these files are not human-readable. If you need to view and access this data, skip to step 3. 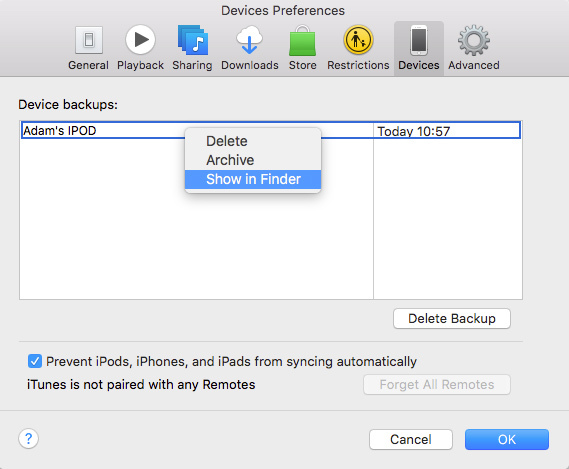 As these backups are designed to keep your data safe, until needed for an iPhone restore, you cannot view and access individual items within the backup - e.g. if you want to copy out a particular photo album to your PC. If you'd like to browse your backups, and extract data from them to your PC, you'll need a third-party software like iBackup Extractor. If you should need to retrieve data from your iOS device backups, such as contacts, messages, photos and more, iBackup Extractor can do just that! With iBackup Extractor you can even access and view the contents of iPhone backups on your computer FREE. Download the free demonstration version of iBackup Extractor today, to see what you can extract from your backups to your computer. There are many reasons that you'd need to restore an iPhone from a backup: Troubleshooting problems on your iPhone, data loss, and a broken/damaged device to name a few. Open iTunes on the PC or Mac that you backed up your iPhone to. Connect your iPhone with your USB cable. Select your device icon in iTunes. Pick the backup you'd like to restore, and click 'Restore'. If you run into any issues when attempting to restore a backup to your iPhone, Apple's iTunes guides are great!